The Ascort was powered by an Okrasa TSV 1300 engine. 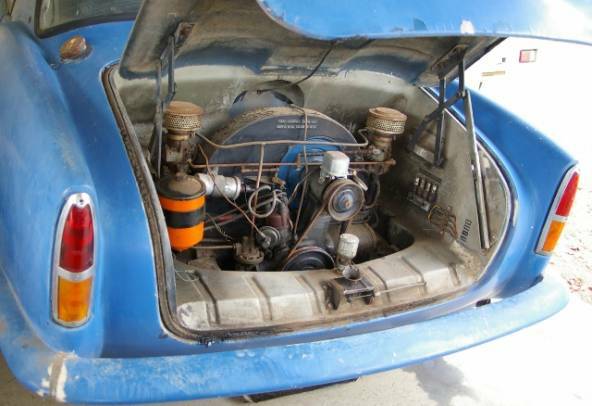 This engine was basically a 36hp 1200cc aircooled VW engine which was significantly modified by an Okrasa kit, containing a stroker crank, dual port heads and twin 32mm carburettors. The kit provided an approximate 30% increase in power giving the Ascort a top speed around 95 mph (153km/hr), which was quite respectable in 1959. In 1951 Gerhard Oettinger founded a company specialising in performance parts for VW engines. This company was “Oettinger Kraftfahrtechnische Spezial Anstalt" or OKRASA. This was one of the first companies specialising in performance components for VW and the engines soon gained a reputation for being of high performance and quality. Several of the 1950s coachbuilders who were using the VW chassis components as the basis of their designs opted to use the OKRASA engines to give the cars the performance to match the looks of the bodies. This included Dannenhauer & Stauss and Rometsch, who were leaders in the field in Europe. 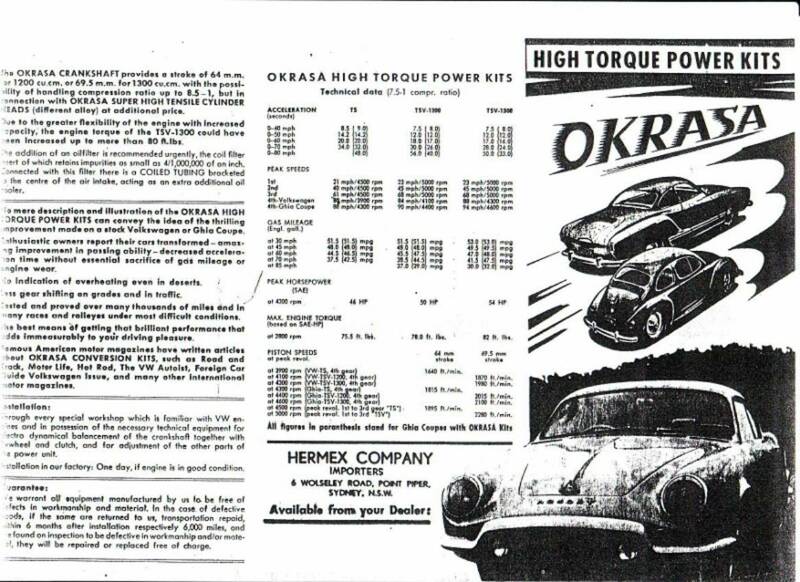 The Ascort designer, Mirek Craney had an interest in both VW and sportscars and this led him to becoming an importer of Okrasa kits into Australia and only natural that this was the powerplant selected for the Ascort. The highest performance Okrasa kit, the TSV 1300 was selected for use, and this gave the the Ascort TSV 1300 the second part of its name. 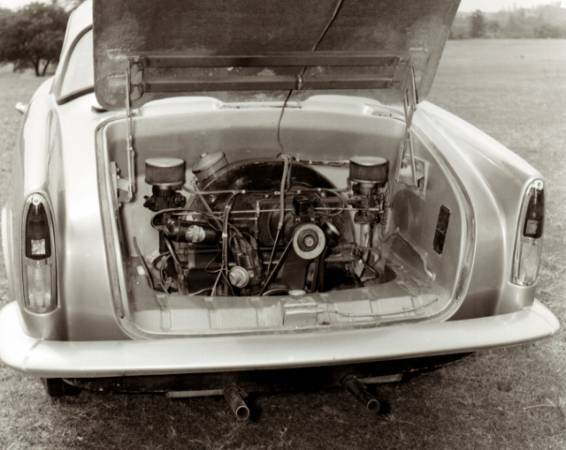 In the 1950s and early 1960s, VW engines were fitted with low compression single port heads and single carburettors. This effectively choked the engine to restrict its revs and power output helping it to have very good reliability. OKRASA offered 2 kits to improve the performance. 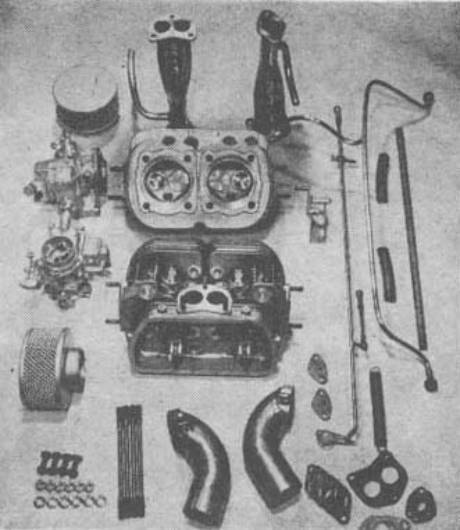 The TS 1200 kit, provided 7.5:1 compression dual port heads, dual Solex 32PBIC carbs as used on early Porsche 356s, and carb linkages, balance pipes etc. Optional extras included a Fram oil filter and a coiled copper tubing oil cooler, which fitted to the opening of the fanhousing. 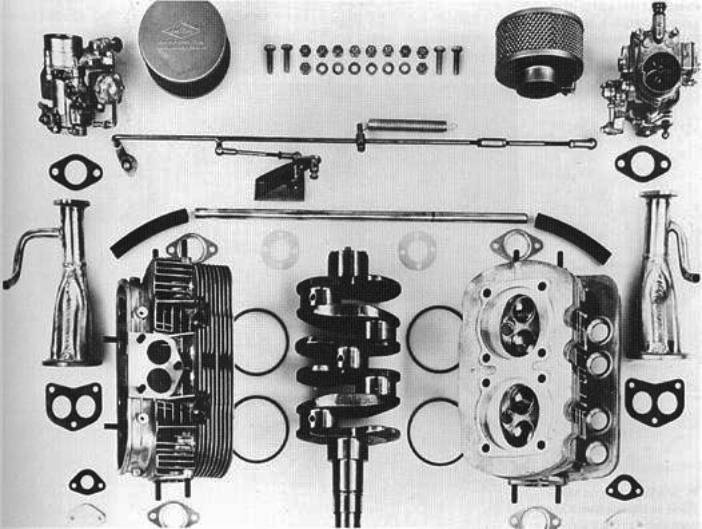 The TSV 1300 kit provided a further stage of performance tuning through the use of a 69.5mm stroke chrome-moly crank which increased capacity to 1295cc. (The stock VW crank had a stroke of 64mm). As well as the increased stroke, the OKRASA crank used 8 dowel pins on its flywheel connection, and could safely rev much higher than a stock crank. Due to the increased stroke, spacers were required under cylinders and longer pushrods were also required. Components for the TS 1200 kit on the left and TSV 1300 kit (as fitted to the Ascort TSV 1300) on the right. The OKRASA engine in the prototype car on the left, and an unrestored late production car on the right. Note that the FRAM oil filter was moved to the side of the engine bay on the production cars. Note also that the prototype car had metal rails between the bonnet hinge assemblies. This was changed to metal strips that followed the body contours, which were embedded in the fibreglass on production cars. Most production Ascorts seem to have an engine number which is not stock VW.  It is in the format “ACA ###”. It is thought that the ACA engine number stood for “Ascort Corporation Australasia.” No record showing how many engines with this numbering system were produced is known to exist. 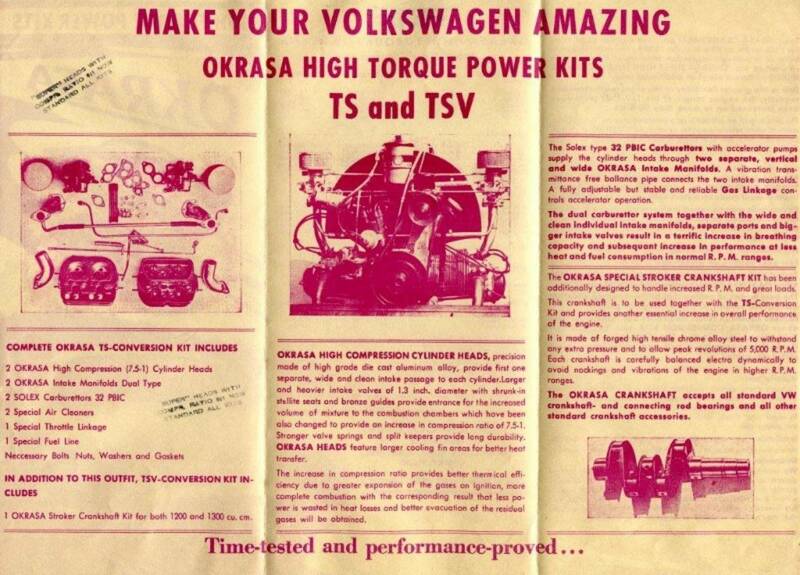 Replica OKRASA kits are now available for 36hp engines for “oldspeed” enthusiasts.